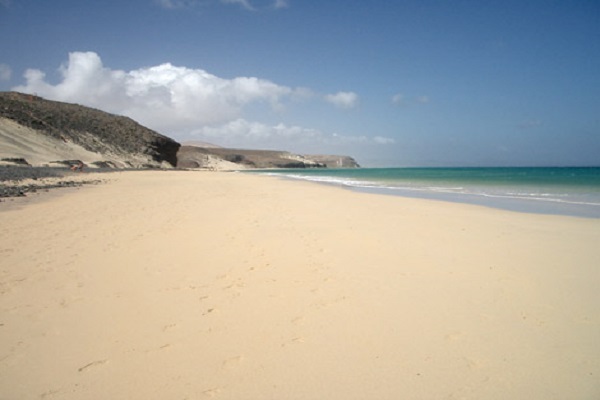 The beach section “Mal Nombre” is an insider tip for beach lovers wanting to enjoy relaxation and tranquility. If you walk from Costa Calma to Jandia (approx. 21 km) you will immediately spot the small black sand castles which are built on the slope. In these castles you are well protected from the wind and can do naturism without problems. The water is very shallow and therefore the beach is also suitable for children. Since you can only lie down in the few beach castles, the beach is calm. Only sometimes a few beach wanderers walk past. On the slope there are about 10 castles, and on the top of the dune there is also one. Since these stone castles are very popular you have to be there in the morning in order to choose the one you prefer. How to get to the beach: On the FV 2, take exit no. 77 “Mal Nombre”. On the roundabout also take the exit “Mal Nombre”. Then you pass a hotel of the Dunas group. Turn left directly after the hotel (at the wall). This narrow road leads directly to the car park at the beach.